Transitional kitchens seamlessly blend elements of classic and contemporary designs for a warm and elegant yet fresh, updated look. Obviously, the concept of transitional design serves as a link between traditional and modern kitchens. Actually, the best part is that when designing a transitional kitchen, you don’t have to follow strict rules. 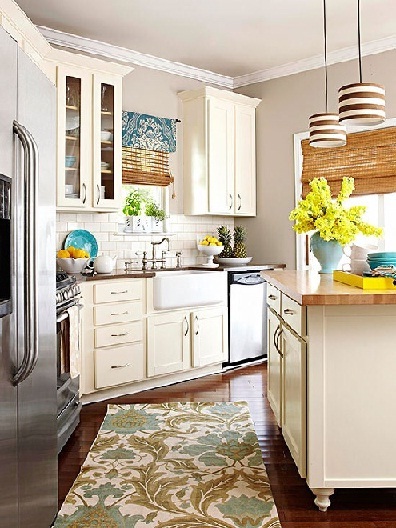 If your kitchen is a transitional one, you can lend it a warm, inviting, old-world look with only hints of modernity. If you prefer modern interiors, create a sleek kitchen with some traditional elements. Mixing natural and man-made materials, finishes, and textures, transitional kitchens are spaces with charm and character. A perfect blend of tradition and modernity, transitional kitchens focus on practicality and creativity. Defined by some designers as “the new classic”, transitional style links past, present, and future to lend any space a timeless look. Although borrowing from both classic and contemporary kitchens, transitional ones have their own specific features, which characterize the perfect transitional kitchen. In general, transitional kitchens embrace neutral colors in varying shades. The result is sophisticated, monochrome spaces with a clean yet warm look. Note that combining different finishes and details helps create adorable neutral transitional kitchens. Also, the timeless black-and-white color combo serves as a perfect transitional option. 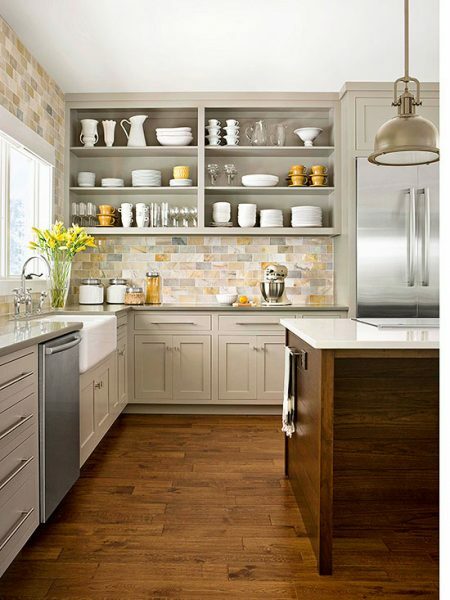 Above, a backsplash of thin horizontal tiles adds modernity to this appealing transitional kitchen. Flooring and chair backs bring in a distinctive organic vibe. However, dashes of color can be always used for extra visual interest. Above, a multi-color striped rug, a patterned window shade, and an oversized vase of flowers add lovely pops of color, freshness, and tons of personality. Actually, mixing organic and manufactured materials appears to be a keystone of the transitional design. In addition, this mix lends an eclectic look to the space. A combination of wood, stone, glass, marble, and steel works well in any transitional kitchen creating a completely harmonious whole. This means that items such as wooden cabinetry and flooring, marble countertops, and stainless steel appliances can be used all in the same space. Marble, granite, quartz, or limestone are the perfect choice for the countertops and backsplashes. Get creative and don’t be afraid of using unusual materials, this is a surefire way to make your transitional kitchen feel customized. 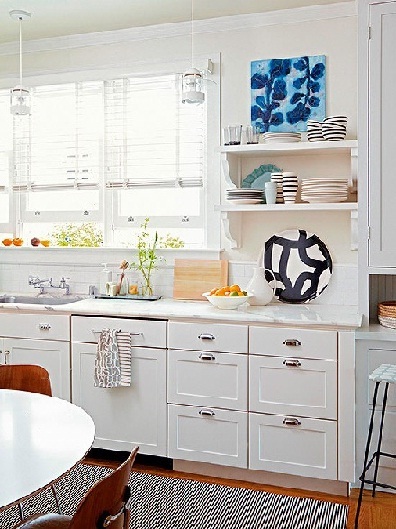 Thus, a handmade concrete countertop can definitely lend a unique look to any transitional kitchen. As for floors, they can be can be wood, tile, or made of other natural materials, such as bamboo. Above, a transitional kitchen with stainless steel appliances, simple white cabinets, shimmering gray granite countertops and a backsplash, wood flooring, and reclaimed-wood bar stools. Pops of yellow add color, freshness, and an extra dose of personality. In transitional kitchens, cabinets are with clean lines, almost without intricate ornamentation and decoration, often with simple glass inserts, usually made of wood, and with simple paneled doors and shiny hardware. Actually, adding modern hardware to classic kitchen cabinetry helps achieve a transitional kitchen look. In general, transitional kitchen cabinetry can be defined as “classic with a contemporary twist” with a focus on the simplicity and sophistication of the design. 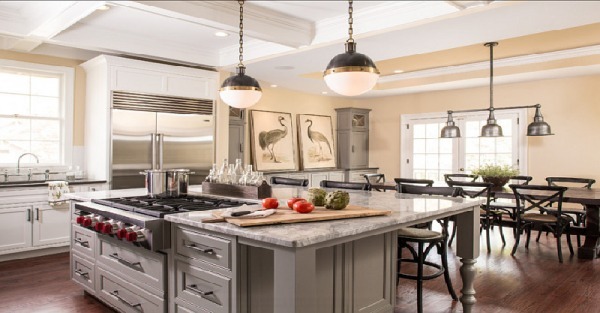 Note that Shaker-style cabinetry is a common choice for transitional kitchens. The streamlined profile of the cabinetry balances with natural materials to lend the space an uncluttered yet warm, inviting look. 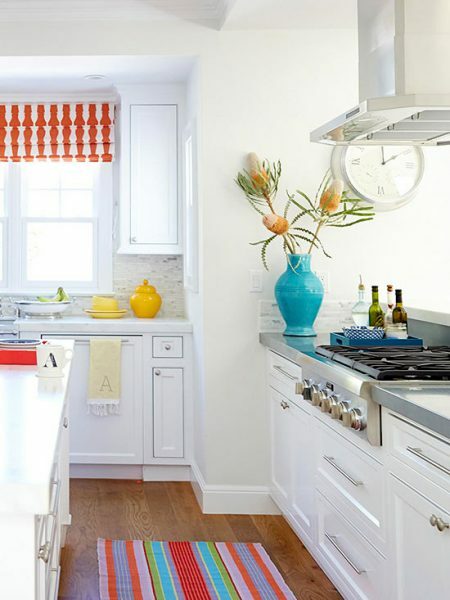 Above, glass front upper cabinets serve double: lighten the kitchen and put colorful dishware on display. Pops of blue and yellow add extra color and freshness. An apron-front sink, butcher block tops, and stunning flooring add character to this charming transitional kitchen. As already pointed out, transitional kitchens are usually in neutral colors. Instead, these designs can use a lot of texture in various combinations, such as tile surfaces, wood flooring and countertops, and stone surfaces/polished or rough/. Generally, if you like incorporating different textures, transitional kitchens are just the perfect space to unleash your creativity. Plus, combining textures of a different kind definitely provides visual interest and adds personality to the space. Above, a multicolor marble tile backsplash, quartz tabletops, and a wood island and flooring work well together in this transitional kitchen. Open shelving adds a sense of space. A vase of flowers brings in color, scent, and freshness. Transitional kitchen designs borrow elements used in the past and blend them with contemporary features. The result is that you can create a kitchen that looks new and fresh to best fit your living space and way of life. The best thing about this practice is that it allows to mix and match the past and the present in a way that shows your taste and preference and expresses your personality. Thus, for example, you can mix Shaker-style cabinets with colored glass pulls and knobs, wood floors, ultra-modern stainless steel appliances, and more traditional elements. Note that farmhouse sinks redesigned with a contemporary finish work well in transitional kitchens. 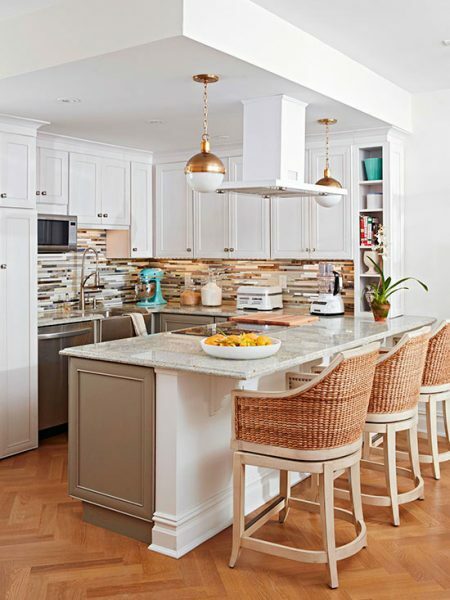 In general, you can mix design eras, metals, finishes, textures, and even incorporate exotic woods to lend your kitchen the look you like most. Furthermore, you can recycle items you don’t use anymore. Give classic style furniture pieces fresh, modern touches and transform them into décor elements that would serve you in your transitional kitchen. This is definitely an affordable way to add character to the space. Above, a transitional kitchen with a classic subway tile backsplash, vintage-looking cabinet pulls, and a bridge-style faucet. 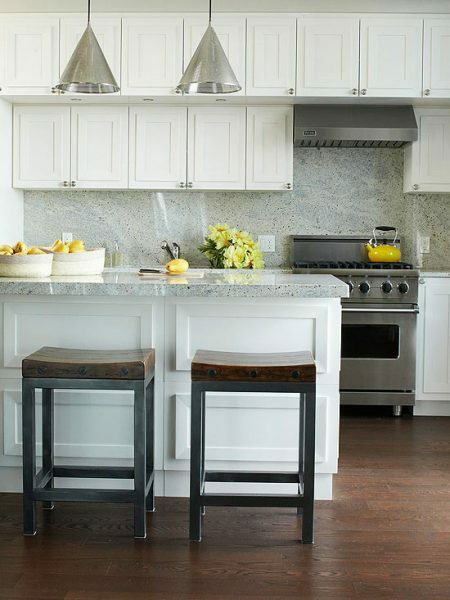 Marble countertops and white cabinetry with clean lines lend the space a fresh look. A piece of wall art, a display of beautiful dishware, and fresh flowers add color and visual interest. Accessories in transitional kitchens are kept to a minimum. Generally, try to use simple accents and patterns and keep the space clutter free. 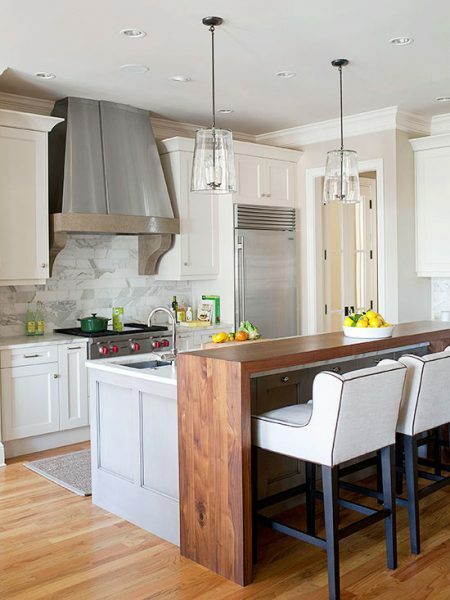 On a side note, any traditional, modern, or Industrial-style lighting option will work well in transitional kitchens. It should be large enough to draw attention and give the kitchen adequate artificial lighting. At the same time, the fixture should be with relatively clean lines and match the overall color palette. Of course, you can always opt for one-of-a-kind pendant that will immediately become the focal point of the space. In the above-shown transitional kitchen, which is all about the perfect symmetry, the only accessories are simple displays of colorful bottles and pottery positioned on two floating shelves and on the counters. However, you can’t go without any decorative ornamentation. Hints of millwork, corbels, trims, and simple crown molding fill the gap between ornate and plain. Be careful to not overdo the ornamentation, otherwise, the look of the kitchen will become more traditional. A smart approach to try is adding unique details to give your kitchen personality. Anything from favorite antiques and a colorful area rug to kids’ artwork, a zinc table, and a capiz chandelier to one-of-a-kind pendant and a chalkboard backsplash can do the jobs. You have endless options, your only limit is your imagination. In the kitchen above, stone-like corbels both help the stainless-steel range hood blend with the kitchen and add visual interest to this inviting space. 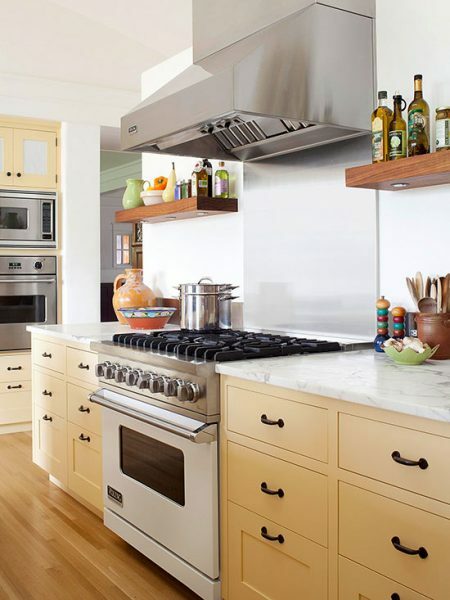 Appliances in transitional kitchens are almost always stainless steel. Sometimes, panel fronts are added to kitchen appliances so they mimic the cabinetry to create continuity throughout the space. Above, a transitional kitchen with stainless steel appliances, a white subway tile backsplash, and white millwork details. Splashes of color add freshness and visual interest. What actually grabs the eye is the unique island, which offers both workspace and banquette seating at the dining table. Blending the best of traditional and contemporary kitchens, borrowing aesthetics from each of the two design styles, transitional kitchens offer flexibility and adaptability and are the perfect option for people who do not want to limit their choice to a single design style. Their look is warm, inviting yet clean and unfussy. Although some feel modern while others are more traditional, all transitional kitchen are an embodiment of balance, harmony, warmth, and simplicity. Cleaner than the traditional kitchens without being too sleek and more detailed than the contemporary ones without being too ornate, transitional kitchens are as rich and elegant as to fit you taste, while maintaining a certain degree of a contemporary flair.